David Tolchin is a senior associate of the firm, has been with Jaroslawicz and Jaros for twenty (20) years since graduating from law school. He is a graduate of Brooklyn Law School and has and is admitted to practice in the courts throughout New York State and in the Federal District Courts for the Southern and Eastern Districts of New York, as well as the United States Court of Appeals for the Second Circuit. 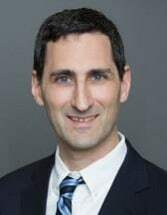 David is an experienced litigator and appellate counsel, Mr. Tolchin has prepared and argued numerous appeals before the Appellate Divisions of the New York State Supreme Court, and has briefed appeals for the United States Court of Appeals, as well as the New York State Court of Appeals, New York's highest court. He has also prepared and argued significant motions at the trial court level. Areas of law include medical malpractice, breach of contract, automobile accident liability, sexual discrimination, bankruptcy stay relief, Labor Law construction worksite accidents, products liability, and pedestrian sidewalk injuries. David is also perfectly fluent in Spanish.